Our Electronic Check Processing programs automate check authorization and deposit for a business, eliminating trips to the bank. With each authorized check, funds are electronically processed, uploaded and deposited into the merchant's account. * Remote Deposit Capture, back-office conversion, check processing with recovery services, auto industry-specific programs and guarantee features are all available. It's easy to get started with these payment processing services. Click here for a free consultation. Use this unique processing program with your PC and imager for timely deposits. Auto Industry enhancements available with C.A.R.S., the Remote Deposit Solution for dealerships. Offers the convenience of electronic check processing along with automatic assignment to collections for transactions that fail to clear. 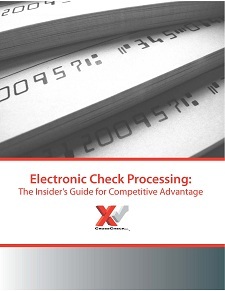 Streamline processing at the Point-of-Sale when your customers pay by check. Compatible with most types of imagers and terminals. For mailed-in checks, use the Business Office Conversion enhancement.